Lewis and Clark faced unimaginable hardship to explore the Pacific Northwest. 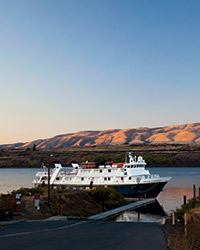 Writer Bill Donahue has much more fun on a luxurious, locavore cruise along the Snake and Columbia Rivers. From high up on the ship's deck, I could almost see them as I gazed east: Meriwether Lewis and William Clark, the intrepid explorers, shambling west through Idaho's Bitterroot Mountains in September 1805, gaunt and hungry. I saw them trudging through an early snowstorm, their buckskin in tatters as they shivered in the dank cold. But then a steward came by, interrupting my reverie: "Can I freshen your blueberry lemonade?" I was aboard the National Geographic Sea Bird, a small cruise ship on a mission. Supplied with a full bar, a masseuse and 27 other attentive staffers, the 50-odd passengers and I were retracing the westernmost reaches of Lewis and Clark's journey from St. Louis to the Pacific. We were sailing for seven days and 450 miles on a new route for the cruise line: west from the Idaho-Washington border on the Snake River, then south and west over the mighty Columbia, through the cragged Columbia Gorge and on to the ocean before we backtracked east, to Portland. We were traveling in autumn, sampling wild steelhead trout, Pinot Noir from Oregon's Willamette Valley and, at cocktail hour, platters of local apples and pears. The food was not only tasty but virtuous: The ship's owner, Lindblad Expeditions, had recently deepened its commitment to sourcing sustainable, organic and humanely raised ingredients. When we weren't eating the best Northwest food, we were learning about Lewis and Clark. One afternoon, we rode a tour bus to a remote spot on the Clearwater River called Canoe Camp, where, for 10 days in 1805, the explorers hunkered down, carving five massive canoes out of pine trees. Our guide explained that the men were ill at the time, having just gorged on a Nez Perce Indian staple, the starchy, potato-like camas bulb. It wreaked havoc on their digestive tracts, probably because they didn't cook it long enough. After he ate his camas, Clark wrote in his journal, "I am verry sick to day and puke which relive me." We Sea Birders admired a rough-hewn replica canoe, marveling at the craftsmanship, then repaired to the ship's lounge for hors d'oeuvres. We also drank—both a Charles Smith Boom Boom Syrah from the Columbia Valley in Washington, which tasted of licorice and blackberry, and a glass of hard elderberry cider, tart but sweetened by honey, and so much more divine than camas. My fellow Sea Birders could get happy at happy hour, but they were an earnest and cerebral bunch. At evening lectures in the ship's lounge, questions abounded: "Could you go over again exactly how volcanoes are formed?" People were just as curious to learn about the food we were eating, from the applewood-smoked bacon at breakfast (Pendleton Farm) to the lamb shanks with rosemary at dinner (Anderson Ranch). After an evening lecture, I'd lie on a deck chair and gaze up through clear skies at the stars. 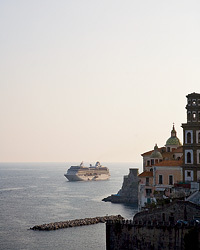 Later at night, sleeping in my smart little stateroom, I'd feel the ship slow down. A host of mechanical sounds would ensue—the clanking of chains, then a low, grinding sound—and I'd look out to find that we were deep in the industrial chasm of a river lock. There were eight dams and eight locks on our route. Water wept off the high concrete walls looming above us, and we sank—down, down, down toward the core of the Earth—until, finally, the dam gates released us and we were once again on our way. We went kayaking one day, with the ship's staff transporting huge bundles of tiny boats to the shoreline and setting little stepping platforms into the water so that we could maneuver into paddle position without dampening our ankles and socks. We learned about the columned basalt cliffs lining our route; later, we shared our experiences over a dinner that ended with huckleberry crème brûlée. In down moments, I chatted with the 26-year-old chef, Clayton Barton, who'd fetched the organic huckleberries himself from a farm just off the river. "We're scouting for meat and produce as we go," he told me. "It's amazing here: The Draper Valley Farms chicken, the Bosc pears. I bought a pint of blueberry honey, and it's already gone. I ate it all myself." 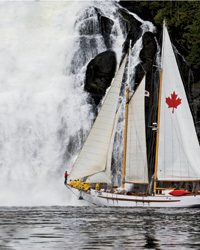 At times on the Sea Bird, I craved more of the adventure Lewis and Clark had experienced. I convinced Barton that we at least had to sample some camas. I phoned my friend John Kallas, the Portland-based author of Edible Wild Plants. "Nearly all the camas habitat here has been destroyed by development," he said, ruefully, "and if you wanted me to procure wild camas for you, you'd need to hire me for two days." "Couldn't I look for it myself?" I asked. "You might not know the difference between edible camas and death camas," he replied. I grew glum. But then he added, "Some nurseries sell camas, as a decorative flower." Kindly, he agreed to throw some nursery camas into a Crock-Pot and let it steep for three days as the Sea Bird rolled west. When we reached Portland, he met us with a small jar of warm camas bulbs floating in brown camas syrup. I let Barton taste first. He took a bite. "It reminds me of sweet potatoes. And the syrup, it's almost like cane syrup. You could put this stuff on pancakes!" A sous chef chimed in from the kitchen. "The aftertaste is a bit like espresso," she said. Barton brought out a pile of spoons; the whole crew partied with camas. And as I was leaving, Barton was actually toying with the idea of serving camas on a future trip. "Maybe as an appetizer," he said. "Or it could go with grilled pork"
Somewhere, I imagined, Lewis and Clark were wishing they could travel this route once more. Portland, Oregon, writer Bill Donahue has written for The Atlantic, Wired and The New York Times Magazine.